When it rains, it pours even when the skies are clear. That was the case for the Wood River High School football team when it hosted the visiting Minico Spartans at Phil Homer Field on Friday night as the Wolverines opened their 4A Great Basin Conference schedule. The Spartans took advantage of Wood River’s mistakes, sent starting sophomore quarterback Alec Nordsieck off on a stretcher, and routed the Wolverines 49-3. Wood River’s lone score came with three seconds remaining in the second quarter on a 27-yard field goal from junior Kyle Weller, the first-ever football field goal for the Hailey soccer team’s goalkeeper. Despite the score, Minico outgained Wood River by only eight yards (Minico 276, Wood River 268). And the Wolverines dominated the time of possession (Wood River 34:05, Minico 15:21). Statistically, it was a close game. Coming into the game, both teams were looking to get back in the winner column after defeats from the previous week. It was an uphill battle for Wood River (1-4, 0-1) as it had its hands full with Minico (3-3, 2-1). The Spartans are never easy to play so penalties don’t need to stick their ugly head in the game, but that’s what happened. 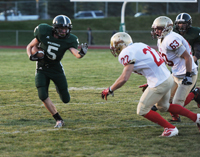 Wood River had six for 50 yards, compared to Minico’s two for 20. The night started with a bang as the Wolverines kicked an onsides kick. Although Minico pounced on the ball at its own 40-yard line to gain possession, Wood River recovered a fumble on the first play of the game. Wood River defensive lineman Parker Bingham played the ball perfectly and recovered the fumble. Momentum was there for the taking, so on Wood River’s first play of the game, Stilling called a halfback pass that saw Zach Swanson deliver a strike to Austin Savaria for a 58-yard gain. However, it was called back on a holding penalty. Then the Wolverines were called for an illegal motion penalty on the ensuing play, scratching the momentum and pitting Wood River even further for its opening drive. Wood River consequently would have to give the ball right back to Minico with only two penalties to show for it. Minico took hardly any time off the clock as the Spartans marched down the field in four plays and 77 yards to score on a quarterback keeper up the middle. Wood River’s following drive was productive, but another penalty hurt the Wolverine’s chances of making progress. “I don't feel that the score was indicative of our effort but it was indicative of our defensive execution and our procedural penalties on offense,” said Stilling. Despite the effort on the offensive side, Wood River converted only four of its 12 third-down plays. Nordsieck did all he could as he spent much of the game trying not to get sacked. He finished the game with 69 yards passing and 54 yards rushing before being knocked out of the game in the fourth quarter. Nordsieck fumbled the ball, and while trying to recover the ball, was hit at the bottom of a dog-pile. Stilling said he won’t know if Nordsieck be available for the next game. Wood River as a team rushed for 130 yards on 29 carries. Minico had 213 yards on 16 carries, the majority of yards coming from sophomore Peyton Bailey who had 113 yards on only four carries. Wood River also had 13 total first downs to Minico’s six. Leading tacklers for Wood River were Gunner Gibson and Cody Richmond (7 each), Hagan Barsch (6) and Cooper Bailey (4). Bailey had 105 all-purpose yards (14 rushing, 23 receiving, 68 returning). Champe Kotara added 44 yards rushing on eight carries to go along with his three tackles. The schedule doesn’t get any easier for Wood River as it hosts Twin Falls (4-1, 2-0 league) for Homecoming on Friday, Oct. 11. Twin Falls is undefeated in the 4A Great Basin with wins over Minico (40-19) and Jerome (19-14). Twin Falls has won three straight games after last Friday’s 40-20 victory over Skyline in Idaho Falls. After their visit to Hailey, the Bruins wind up their regular-season schedule at home against Canyon Ridge (0-5, 0-2) and Burley (3-2, 1-1), then visit Kuna (3-2). Check out today’s Express Web site for WRHS-Minico statistics. The Wood River freshman football team traveled to Minico last Thursday and beat the Spartans 26-14. Wood River travels to Twin Falls Thursday, Oct. 10 for a 6:30 p.m. game, then hosts Burley Thursday, Oct. 17 at 6:30 p.m. at Phil Homer Field. Minico—Tanner Harper, 20-yard run (Harper run); 6:58 1st (8-0 M). Minico—Chris Caldera, 36-yard pass from Tanner Harper (Efrain Juarez kick); 2:25 1st (15-0 M). Minico-Peyton Bailey, 27-yard run (kick failed); 6:32 2nd (20-0 M). Minico-Daniel Freidburger, 20-yard pass from Harper (Efrain Juarez kick); 2:55 2nd (28-0 M). Wood River-Kyle Weller, 27-yard field goal; 0:3 2nd (28-3 M). Minico—Peyton Bailey, 21-yard run (Juarez kick); 10:27 3rd (35-3 M). Minico-Tanner Harper, 10-yard run (Juarez kick); 5:42 3rd (42-3 M). Minico-Erik Guzman, 40-yard run (Juarez kick); 10:13 4th (49-3 M). Rushing—Alec Nordsieck 8-54, 2 fumbles; Cooper Bailey 7-14; Champe Kotara 8-44; Zach Swanson 2-11; Izaac Easterday 4-7. Passing—Alec Nordsieck 6-12, 69 yards; Zach Swanson 0-1, 0 yards 1 interception; Cooper Bailey 0-1, 0 yards. Receiving—Cooper Bailey 2-23; Zach Swanson 2-4; Austin Savaria 1-20; Gunner Gibson 1-22. Kickoff returns—Zach Swanson 1-10; Cooper Bailey 2-68. Tackles leaders—Gunner Gibson 7, Cody Richmond 7, Hagan Barsch 6, Cooper Bailey 4, Austin Savaria 2, Christopher Lentz 1, Jon Reigle 4, Champe Kotara 3, Izaac Easterday 2, Alec Nordsieck 1, Dee Jay McMurdo 1, Parker Bingham 1. Rushing—Peyton Bailey 4-113; Tanner Harper 5-27; Daniel Freiburger 3-22; Erik Guzman 1-40; Daxton Davis 3-11. Passing—Tanner Harper 4-8, 63 yards, 2 TD. Receiving—Chris Caldera 2-40; Daniel Freiburger 2-23. Tackle leaders—Erik Guzman 10; Noah Michalek 10; Zack Camarena 8; Harley McGuern 8; Matt Jensen 8; Riley Condie 7; Trevor Fries 5; Jody Valdez 5; David Hart 4; Gabriel Montoya 3; Jeffrey Sjoholm 2; Tyler Anderson 2.